The House Intelligence Committee will question longtime Donald Trump associate Rhona Graff on Friday, the latest in a string of key interviews as the panel looks to conclude its probe of Russian meddling in the 2016 election. The committee's closed-door meeting with Graff, who for over three decades was Trump's gatekeeper at Trump Tower in Manhattan and ultimately a senior vice president at the Trump Organization, will be the second this week to take place at an undisclosed location in New York — over the objection of Democrats. Most of the panel's interviews have occurred at a secure location inside the U.S. Capitol and been led by the elected members of the committee. Though the House finished legislative business for the calendar year on Thursday, only a handful of lawmakers are expected to travel to New York for the closed-door meeting. Democrats left Washington for the holiday recess Thursday after a new round of urgent warnings about what they portray as Republicans' stepped-up efforts to undermine the Department of Justice investigation into potential collusion between Trump campaign officials and Russians. Adding to existing concerns that Republicans were seeking to rush the Intelligence Committee's Russia probe, Democrats say expanding House investigations into the conduct of FBI and DOJ personnel risk undermining public confidence in federal law enforcement and come at the expense of steps to address Russian attempts to interfere in past elections and likely future ones. Reflecting the party's concerns at the highest levels, House Minority Leader Nancy Pelosi, D-Calif., wrote to House Speaker Paul Ryan, R-Wis., on Thursday urging him to "take urgent action" to ensure that congressional investigations into Russia's "assault on our election systems" continue. "Political haste must not cut short valid investigatory threats," Pelosi wrote in a letter obtained by NBC News. "Key questions about foreign interference in our elections remain, and must be thoroughly investigated. Nothing less than America's democracy and national security at stake." Meanwhile, a House Democratic leadership aide accused Ryan of being complicit in GOP efforts to stifle meaningful investigation into Russia's campaign of interference. The aide noted there has not been a full committee hearing on Russia's hacking into U.S. elections or power grids, or on combating foreign disinformation campaigns on social media. "Ryan is shielding President Trump from the Russia investigation by rejecting repeated calls for an independent commission and investigation — and enabling the House Intel committee to conduct a partisan investigation," the aide said. Senior Republicans on the Intelligence Committeehave told NBC News that they see the panel's Russia probe nearing a conclusion. This week the panel again held a battery of interviews with witnesses — including three in one day — in both New York and Washington. On Wednesday in New York, committee staff interviewed Felix Sater, a Russian-born former Trump business associate who sought in 2016 to broker a deal for a new Trump Tower in Moscow. 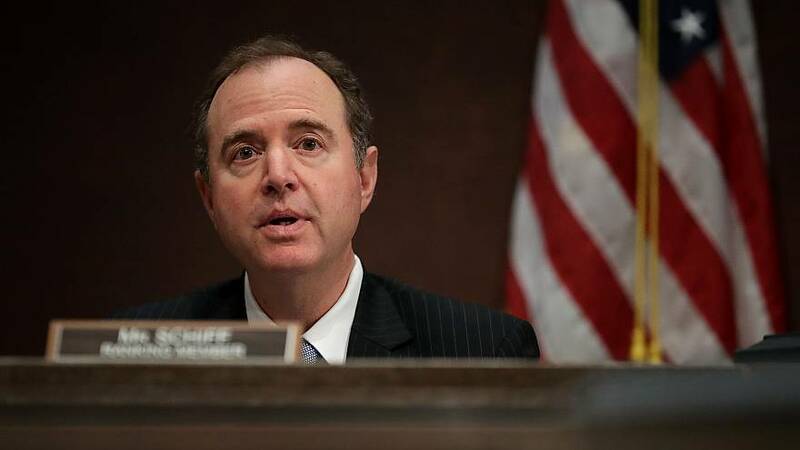 Rep. Adam Schiff, D-Calif., the top Democrat on the committee, questioned the need to schedule so many interviews in such a short period of time and hold out-of-state interviews with witnesses who were willing to appear in Washington next month, saying these were just the latest indications "that there's going to be an effort to shut us down." "In several cases we've only received hundreds of pages of documents the day of the interview, or the majority has received hundreds of pages of documents without informing the minority," he said. "It's no way to conduct an investigation. Not if you're serious about getting to the truth. It is a way to conduct an investigation if you want to give the appearance of legitimacy or you want to bring things to an end." Rep. Mike Conaway, R-Texas, who is leading the Intel probe, said this week that the committee has already completed sections of a final report that could be issued in the coming months. But he also indicated that more witnesses could be called when lawmakers return to Washington in January. "The quicker we get the answers that we believe get to the truth of what happened, who did what where and when, the quicker we can get out the better it is for the American people," he told reporters. On Thursday, deputy FBI Director Andrew McCabe sat for a second marathon interrogation before lawmakers, this time at an "emergency" meeting called by the chairmen of the House Judiciary and Oversight Committees. The closed-door session was narrowly focused on the bureau's handling of the investigation into Hillary Clinton's private email server, members said. He spent more than nine hours on Capitol Hill on Thursday after a nearly eight-hour interview with the Intelligence Committee on Tuesday. A source familiar with McCabe's testimony before the Intelligence committee told NBC News that McCabe confirmed that then-FBI Director James Comey told him that Trump had asked for a loyalty pledge from him. Rep. Elijah Cummings of Maryland, the ranking Democrat on the House Oversight Committee, said in a statement that McCabe showed in his answers that he "is a man of great patriotism, integrity and honor." Rep. Stephen Lynch, D-Mass., another member of the Oversight Committee, said during a break in the interview that the GOP's decision to focus on the actions of FBI personnel rather than the Russians represented a "dereliction of duty" and "a disgrace." "The [democratic] process has been hacked and undermined by the Russians. And we don't want to go near it, because the president doesn't want them to," he said. "I think there's an easy way for us to look at the Russian hacking issue and not implicate the outcome of the president's election. I think he's very sensitive to that. But that should not deter us from doing our job." The situation in the House stands in stark contrast to the Senate, whose own Intelligence Committee is shifting its investigation into a new phase that includes plans to hold open hearings and bring back certain witnesses for additional interviews with senators. The panel is also moving toward issuing an interim report as soon as early January that would include initial findings about Russia's attempts to influence the political debate here. "I think we have to get the election part done pretty early if we hope to have the kind of protections and assistance in the system we'd like to have," said Sen. Roy Blunt, R-Mo. "Remember, people start casting votes in like March." Sen. Mark Warner of Virginia, the panel's top Democrat who this week issued a stark warning to Trump against firing special counsel Robert Mueller, said there was no move to end the committee's broader probe. "I think we'd all like to see it go quicker," Warner said, but adding "to a degree it sets its own pace."